Katie Hodges is a Corporal in the Infantry. She has been in the regular forces for over 5 years and chose the infantry for the physical demands and unpredictable nature of the job. I chose to join the infantry because I wanted the opposite of a desk job. I didn’t want a job where I would be stuck indoors at a desk filing paperwork all day. I wanted to be outdoors, doing something physical, having fun, something challenging, adventurous…a bit of an adrenaline rush and so the infantry definitely puts checks in all those boxes. 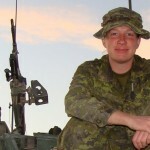 In 2008, after a year of intense training, Katie deployed to Afghanistan. Her family is very proud of her career choice, and while they feared for her safety, they fully support and encourage her to progress in her profession. I’m not a mother yet. I would love to be one day and I can’t wait for that. And when I choose to settle down and have children my days in the infantry will be done. But I don’t think it’s direct conflict. I imagine you could do both quite well. The fact that you have to kill in the infantry is a fact but it’s not murder. It’s a job. We have to kill them before they kill us. If I don’t take care of him then he’s going to try to hurt me or the person beside me, he’s going to try to kill us. So it’s just the way it is. It’s just business. Katie and her boyfriend are both combat soldiers. 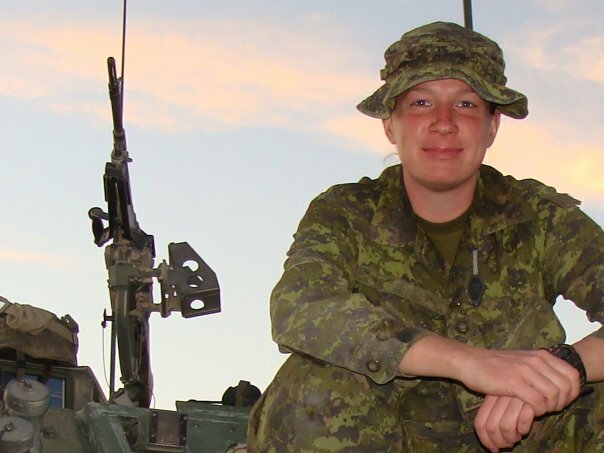 She currently lives in Petawawa, Ontario and is training for future deployments.